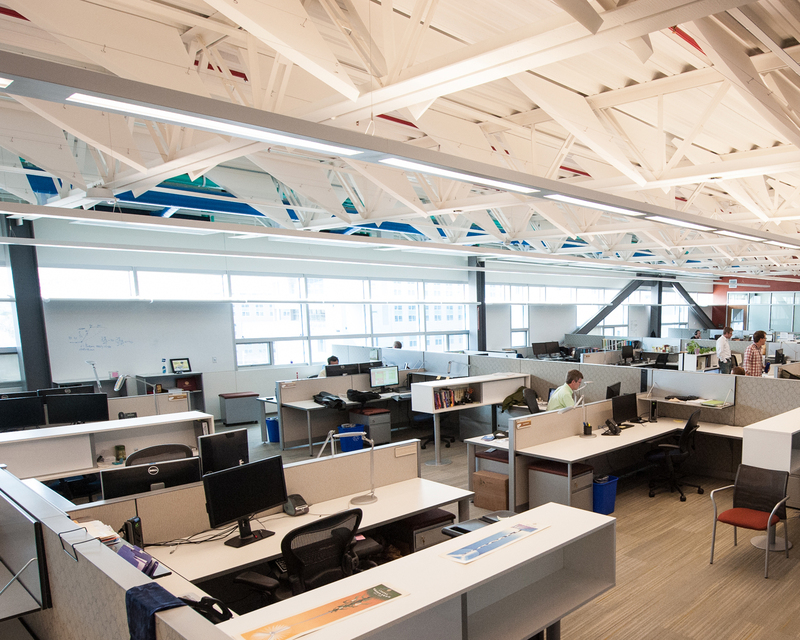 MINNEAPOLIS – When the Energy Department’s National Renewable Energy Laboratory (NREL) in Golden, Colo., designed the Energy Systems Integration Facility (ESIF), one of its primary goals was to showcase sustainable design and energy efficiency. ESIF’s office wing features open-plan office areas with large windows and a metal ceiling deck, which reflect sound and could make it harder for workers to communicate and concentrate. To extend light reflectancy and reduce noise and echo, without detracting from the décor, the architects selected pinta acoustic’s custom willtec® triangle baffles. The workstations within the open office spaces have shorter cubical partitions to allow for maximum daylight, thus lowering energy costs. These shorter walls, along with the hard surfaces, allow sound to reverberate throughout the space. pinta acoustic’s willtec triangle baffles are attractive and absorb sound to make these areas more productive environments with greater speech intelligibility. 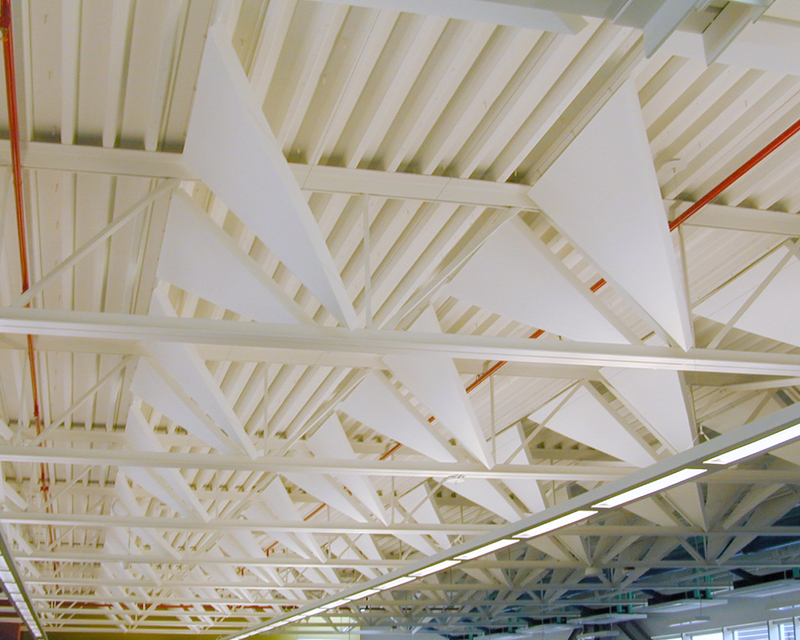 Seven hundred fifty-four HPC-coated triangle baffles were suspended in work areas with 16-foot-high (4.87 m) ceilings. Installed using pinta acoustic’s wall-to-wall cable system, the baffles are hung at a 45-degree angle to complement the line of the bar joists in the metal roof deck. pinta acoustic’s custom triangle baffles are created with willtec lightweight foam. willtec is Class 1 fire-rated and available in natural white or light grey with an optional HPC coating in black, white, light blue, almond, ivory, light grey and medium grey colors. Panel sizes can be any dimension up to 48 inches by 96 inches (1,219 x 2,438 mm), and typical thicknesses range between 2 and 3 inches (51 to 76 mm). Custom shapes, colors and sizes are available. This entry was posted in News, Project Case Studies and tagged Energy Systems Integration Facility, National Renewable Energy Laboratory, pinta acoustic triangle baffles, willtec by pinta. Bookmark the permalink.